Definition at line 31 of file CDataEntity.h. Definition at line 27 of file CDataEntity.cpp. Definition at line 32 of file CDataEntity.cpp. Definition at line 37 of file CDataEntity.cpp. Definition at line 48 of file CDataEntity.h. 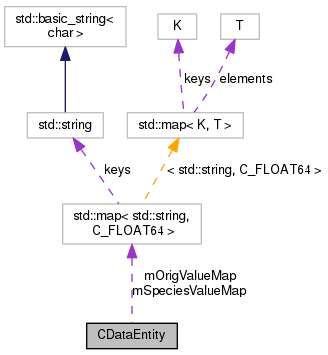 Definition at line 70 of file CDataEntity.cpp. Referenced by CQLayoutMainWindow::insertValueTable(), CQGLNetworkPainter::rescaleDataSets(), CQGLNetworkPainter::rescaleDataSetsWithNewMinMax(), CQGLNetworkPainter::rescaleNode(), CQGLNetworkPainter::showStep(), and CQLayoutMainWindow::updateValueTable(). Definition at line 49 of file CDataEntity.h. Definition at line 58 of file CDataEntity.cpp. Referenced by CQGLNetworkPainter::rescaleDataSets(), CQGLNetworkPainter::rescaleDataSetsWithNewMinMax(), and CQGLNetworkPainter::rescaleNode(). Definition at line 50 of file CDataEntity.cpp. Definition at line 43 of file CDataEntity.cpp. Referenced by CQGLNetworkPainter::createDataSets(), CQGLNetworkPainter::rescaleDataSets(), CQGLNetworkPainter::rescaleDataSetsWithNewMinMax(), CQGLNetworkPainter::rescaleNode(), CQGLNetworkPainter::setConstantNodeSize(), and CQGLNetworkPainter::setConstantNodeSizeForAllSteps(). Definition at line 81 of file CDataEntity.cpp. Definition at line 36 of file CDataEntity.h. Referenced by getOrigValueForSpecies(), operator<<(), and putOrigValueForSpecies(). Definition at line 35 of file CDataEntity.h. Referenced by getNumberOfElements(), getValueForSpecies(), operator<<(), and putValueForSpecies(). Definition at line 34 of file CDataEntity.h. Referenced by CDataEntity(), getTime(), and operator<<().